L: 68.5" x W: 37.5" x H: 37"
L: 34.5" x W: 65.5" x H: 37"
Two children spend their time leaping from one side of the couch to the other and the couch has shown no wear. Love that it is big and chunky. Fits perfectly in our family room! The only thing that I would have preferred would have been to be able to pick my own pillow fabric. Not a fan of dog pillows. I purchased living room and bedroom furniture from Raymour and Flanigan when I moved into my last house and it held up well. When we recently moved into our new home, we decided to purchase new living room and bedroom furniture from them again. 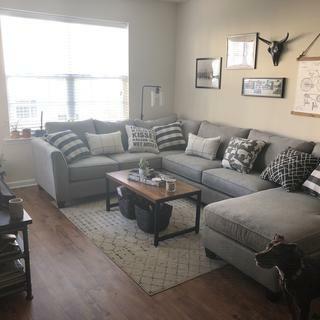 We purchased this couch about 2 months ago and although I love the look and the comfort, it already has saggy seat cushions and is coming apart at the seams. We do not have children and it takes no abuse. It seems like shoddy craftsmanship and poor quality. The material seems to have no "memory". It doesn't bounce back when someone gets up and ends up looking sloppy. We called R&F and they are sending out someone to fix the the seams. It is less than 2 months old. I shouldn't have to have fixed furniture. I feel that the seat cushion that is coming apart should be replaced. I probably will shop somewhere else going forward. I purchased this couch a week ago. It was delivered quickly ina. Time frame that worked well for us. The couch is very comfortable and looks great in our living room! Easy to maneuver for different options as well. Very happy with my purchase. So far, this product is the best couch we have owned. We love that it came with no-slip grip bottoms on the legs as well as hardware to link the pieces of the couch together. The fabric is holding up well so far and the pillows seem well-made. Excellent service and performance from sales, customer service and delivery/setup. I would definitely make future purchases from the Collegeville store. So far so good. I just wish it didn't come with two pillows with dog design. Weird. 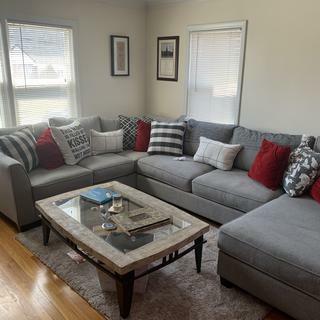 It is nice and mostly came as appeared in the photo except that one of the legs did not screw in properly so it is now just hanging off of the sofa and the connectors used to connect the different parts of the sectional resulted in the sofas not being exactly aligned. Love this sectional!! The fabric is exactly what I wanted. The dog theme didn’t hurt either. Our couch arrived exactly when they said it would and was put together in a flash! They even threw in the throw pillows which was a fantastic addition we were not expecting. Everything was done professionally from start to finish! Looks great. Delivery was easy and on time! Karen, thanks so much for taking the time to leave this review! We're so glad to hear you had such a wonderful experience with our team. If you'd like to leave a review for the specific showroom you shopped at, please visit our Google or Facebook pages—we're sure the team would greatly appreciate it! Perfect for our space. Love the chez. Very comfortable! I was very please on how the staff took care of me . Very friendly and informative. The quality of the furniture on display was excellent. My order was fast and the delivery men were pleasant. Very pleased all around. Quality furniture at a fair price. Delivered on time with no problems. Items were exactly what we wanted and look great! Very pleased with the whole experience. Raymour and Flanigan is our place to go for furnishing our home. So far, love my new couch! So bright! Sectional was great and the sales team was friendly and helpful. This sofa is comfortable and we love that there is a lot of seating for our whole family! The service and delivery were both awesome. Highly recommended! A must have in sectionals!! Comfortable. Perfect color. Saw this in an Instagram post and had to track it down. Honestly fits perfectly in our living room and gives us more seating. Delivery was fast and quick and easy! So happy with this purchase! I bought the stuff for my son and his new wife and they really love it the chaise lounge is what she was looking for after she get off from a long day at work she likes to relax on it and read a book. Happy with the quick delivery and it looks amazing in my house thank you! So far we love this couch! fits perfectly in our apartment and is super comfortable. Loved that it came with all the pillows too. my experience with raymour and flanigan was great. the sales person was terrific. the delivery was great, the men were quick and did a great job. The sofa is a perfect fit in our family room! We love the quality of the fabric and it is extremely comfortable with all of those pillows. Thank you Raymore and Flanigan! The sofa is super comfy and very well made , looks modern and it’s really just add more stylish look to our living room , I’m just confused that we got 7 pillows with it but as I remember from the store it’s was 8 and even now on the pic it’s 8 . Love my new sectional! So comfortable and matches everything! This is great. Very comfortable. The sofa is just what I expected it to be. It is comfortable and looks great in our living room. The best part it comes with the pillows to give it such a great look. Love love love how it looks!!!!! Comfortable and big!!! Amazing couch at an affordable price! We were looking for a sectional for a while and after multiple sits on other couches this was the one. It's very comfortable and supportive. It's a perfect fit in our family room and the kids love it as well! We’re still breaking it in but I like the look and fit in my family room. Seems very well made. Not sure that I would buy the lounge again since it’s kind of wasted seating. Probably would rather have another love seat. The only thing I really don’t like are the dog themed pillows since I don’t have a dog. They got put away till I give them to someone with a dog. This couch is comfortable but still stylish. If you are on a fence about this purchase... BUY IT! I love this couch, it goes with so many different styles, the look is timeless and it's comfortable. I will say it's a bit on the firmer side, but I've also only had it for a week, so I expect after a good amount of use, it will soften up more. The pillows that come with the sofa really complete the look and make the look even more "homey". I really have nothing negative to say about this item, couldn't be happier. Love this couch! Very comfortable and looks great too! Beautiful and comfortable. It was Missing a pillow- should have been 8 and only came with 7.I plan to call to get that delivered or available for pick up. I would recommend this product! The couch is very comfortable and fits percent on my house. I did notice that the chaise has a mark on it, but I called and the customer care team scheduled someone to come out this week. Hopefully they will replace my cushion. I’ve only had the sofa for a week. Love it very comfortable setting for me and my family! Would recommend this item. Looked as described, very light gray color. The cushions were very firm, but you could tell would give over time, and definitely not uncomfortable. Looks great, and bigger than I thought it would be! Very nice piece of furniture for the price point. Seems like quality construction which is our primary concern, but will see with the test of time. I love the sofa itself but just don’t care for the throw pillows. It would have been a 5!Also, our sales rep Cyndi at the Oaks, Pa store was amazing! She remembered us from when we visited the store the week prior and even gave my 5 year old a balloon which she loved! Saw this in the store and fell in love with it. Initially, it’s comfortable but the back pillows are way too bulky and it makes it uncomfortable to even remotely laid down on the couch. Pillows are terrible quality and with in the first couple days we noticed fibers and strings coming out of the seams. The questions themselves lose shape quickly and again, I’ve only had this couch since spring. Very disappointed in the forward holiday season and exams spending a little more and getting something that would last long. I will be lucky if this couch survives a year or two. Accent Pillows are 20" x 20" and Kidney Pillows are 10" x 20"
What’s the minimum doorway clearance? BEST ANSWER: The recommended door width is 36"
If the frame height without piilows is 27.5 as quoted, then wouldn’t the minimum door width be about 28 inches. Curious as I am limited on the door width to my basement so this is the difference between buying this or spending my money elsewhere. Yes, you are correct if the sofa piece are turned on their side. With the legs and back pillows removed it will fit through a 28" door way. BEST ANSWER: No they actually aren’t. It’s actually very annoying because they’re always slipping off and we constantly have to readjust them. No. All cushions (back and seat) are unattached. hello...what material are the furniture legs made of? BEST ANSWER: They’re made of wood. Are the curtains available for purchase? If so what is the length? Also is the carpet available for purchase? And what is the dimensions shown in pic? BEST ANSWER: Hello Tina, thank you for your interest in the Daine collection. We do not offer curtains for purchase, but I will try to find out where they can be found. I have also asked our photo studio department what rug they have used. I will have answer for you later this morning, thank you for your patience! Hi Tina! The Chelsea in Ivory rug can be found on our website. The curtains are Linden Street Striped and were found on eBay, so I am not positive you be able to find these easily. I’m sorry, also do you know the dimensions of the ivory Chelsea rug in photo? Hello Tina. The size of the rug in the picture is unknown however we would recommend either the 6' x 9' or 8' x 10" size rugs. I absolutely love this couch and I am looking for a configuration that will work in my apartment. I can't go bigger than 124' and I want the chaise lounge piece. Is there any configuration that could work? Thanks! BEST ANSWER: Hi Danielle, thank you for your interest in the Daine sectional! You may choose pieces to create your own configuration that will best fit your home. To order a customized sectional, please contact our online sales department 866.383.4484, option 2 or visit your local showroom. An associate will assist you with your order! Is there a way to have only the side with the chase and put an end piece where the corner piece is? If so what would be the price? BEST ANSWER: Hi Kathleen, thank you for your interest in the Daine sectional collection! You may choose your own sectional configuration. For pricing, please contact online sales 866.383.4484, option 2 or you may visit your local showroom. 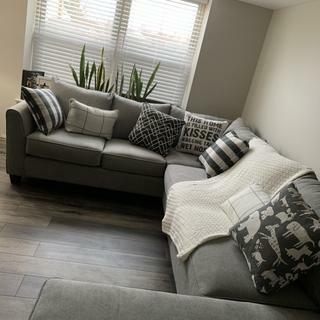 Is there a similar couch to this one that you can pick the fabric? I am not the biggest fan of this color but love the couch. BEST ANSWER: Hello Alexandra, we stock the sofa as pictured for immediate delivery. Other fabric choices are available to special order and can be viewed exclusively through your local Raymour & Flanigan store. My door width is 33 inches. Can this fit? Since the frame heigh is 27.5 inches I was thinking it can be flipped and brought in so the frame height is the width. BEST ANSWER: Hello Natasha! 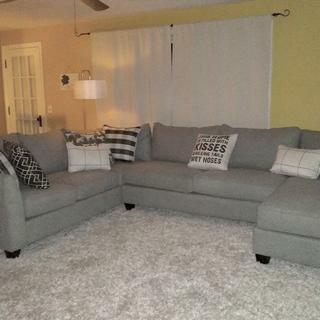 Yes, the Daine sectional pieces should have no problem fitting through your doorway by turned on its side to get the frame height without feet and back pillows. Can I purchase Left-arm facing sectional (L 96.5") along with Right-Arm-Facing Sofa (L 86.5")? In store I was told I can not combine these as I will need a corner. However from the pictures, it seems possible to combine them without a corner. BEST ANSWER: Hello Kristen, thank you for your interest in the Daine sectional collection! I have confirmed with the manufacturer and yes, these two pieces can be used together as long as you have the room. The right arm facing sofa piece should just connect to the front end of the left facing sectional as shown in our provided images. Can I purchase the material on the throw pillow separately? BEST ANSWER: The throw pillow fabric alone is not available for purchase. If you would like the throw pillows, they can be ordered through your local showroom! Is the cabinet in picture available? BEST ANSWER: Hello Jane, thank you for your interest in the Daine sectional! Yes, the Drake Media Credenza is available for purchase. In case you are also interested in the Jillings coffee and end table, we offer those as well. Are the throw pillows available for purchase separately? BEST ANSWER: If the throw pillows are available from the manufacturer, you may request a special order through your local showroom, or by contacting our online sales department 866.383.4484, option 3. Do the cushion covers have zippers? BEST ANSWER: Yes, they have zippers, and are refillable and reversible. I was in store today and they said it was out of stock if I order this online will I receive it in the 3 days as promised? BEST ANSWER: If you were to order online today, you would receive it by June 10th 2018. Please contact our online sales department 866.383.4484, option 3. We would be happy to assist you with this purchase. Do you have the floor lamp for sale? BEST ANSWER: Yes! You can search by SKU: 350242396 Trinity Arc Floor Lamp. do you have the coffee table shown on the picture? BEST ANSWER: Yes! You search by SKU: 300382722 Jillings Glass Coffee Table. There is also an end table and chairside table in this collection, if you are interested. Do you have the accent chair shown in the picture? BEST ANSWER: As of right now we are waiting on stock to arrive for the accent chair you see in the image. It should be arriving in a few weeks. Here is the SKU # if you want to check up on it - 259028150 Daine Accent Chair. You may contact our online sales department to see when the accent chair should be arriving 866.383.4484, option 3!